2 drawings on paper (1 sheet) : ink : 9.5 x 6 in. 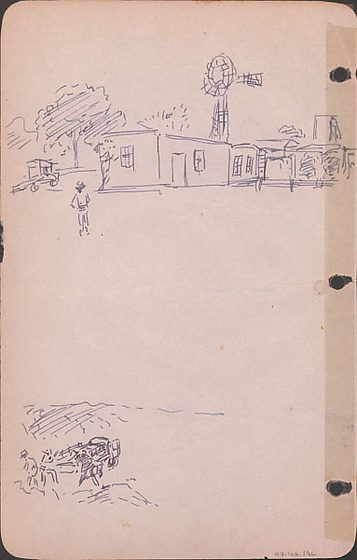 Ink sketches of a man outdoors with buildings, windmill, and truck and figures with truck. Top sketch of figure standing in foreground left ; truck parked on left beside a series of buildings spanning middle to right edge ; windmill rises above buildings center ; trees in background. Bottom sketch of three figures near bed of truck in sparse landscape. Drawing 97.106.1BK on recto of same sheet.